There’s an old saying in the Islamic world that “the Quran was revealed in Mecca, recited in Egypt, and written in Istanbul.” Istanbul calligraphers were the pick of the litter in Ottoman times, and their legacy continues to be felt today, undercover in hidden galleries and workshops, beneath the veneer of modern Istanbul. Many art schools in Istanbul have calligraphy departments, and there are several master calligraphers who received their Icazets (calligraphy degrees) from the last generation of Ottoman masters. All this despite Atatürk’s script revolution, which effectively supplanted Arabic with the Latin alphabet in 1928. Going around Istanbul, particularly in the book section — the Sahaflar Çarşısı — of the Grand Bazaar, you can find scores of shops selling calligraphy and pages that seem to be taken out of illuminated manuscripts. Many of these are shops that cater to unschooled tourists, with poor quality calligraphy created by artists who don’t have an Icazet. 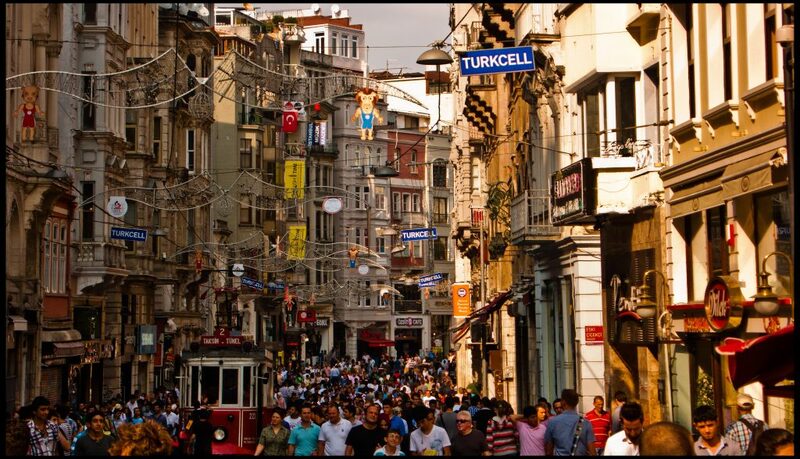 Not so in Tophane, at the foot of Kumbaracı street, a short walk down from Istiklal Caddesi, Istanbul’s famous pedestrian thoroughfare that cuts through the district of Beyoğlu. At Kumbaracı4 stands Istanbul’s only gallery specializing in top quality Islamic calligraphy (hat sanat). The gallery was started by three friends interested in the art form. They felt there were hundreds of galleries in Istanbul, especially Beyoğlu, which dealt with Western art, but not a single one dealing with Turkish Islamic art. In 2012, Edip Sağlık, Erhan Geyik and Ebubekir Mete opened the gallery as “Turkey’s first Islamic art gallery.” In addition to hat sanat, they also exhibit illumination, marbling (ebru), and miniature painting. Former Deputy Prime Minister Nazim Ekren attended the opening, along with 40 artists. The exhibition was called Nokta’nın Ustaları, “Masters of the Point.” The prices are daunting: Works fetch anywhere from $5,000 to $50,000. Many artists exhibited in the gallery live in the surrounding neighborhood of Tophane, an old quarter, poor and abounding in men’s social clubs, small workshops and nargile lounges. The artists are mainly religious people, but they aren’t necessarily Turkish; many come from Iraq, Iran and Syria. What unites them is their domicile in Istanbul. Before the gallery opened, this particular Istanbul neighborhood was the center of a bit of unrest, which focused on a handful of contemporary art galleries that had established a foothold in the neighborhood, opening their shows with tables offering wine to guests on the street. Traditionally minded men in Tophane were scandalized at the free-flowing booze on streets, which they generally regarded as their preserve. Windows were smashed and tables upset. The guys that I know, who sit together, talk together, say hello to me, were not responsible for these events. They were very religious people. I have to say, this is a very old part of Istanbul. The cafes are full of people. If they hear that one of their friends was disrespected by someone, 20 of them get together and start some trouble. You see, some people want all this area changed. It has a certain value. If something opens, the value also increases. The people here don’t want this kind of violence to happen here. They just want respect. If there is going to be wine, then have it inside, not out on the street. Show respect for the people. Hat Sanat is known in Arabic as khatt Islami, meaning Islamic line, design or construction. A feeling of deep affection for the Quran, as well as the idea that figurative art was idolatrous, led to calligraphy becoming one of the major branches of artistic expression in Islam, occupying a status even higher than that of painting. In lieu of the representational arts, calligraphists depicted the Hilye-i serif, an Arabic word meaning description of the Prophet Muhammad’s features: how tall he was, his face, beard, physical characteristics. Traditionally, a student would copy a master’s work again and again until the student’s handwriting matched that of the teacher. For many practitioners, the art transcended the limitations of mere profession and was elevated to a spiritual dimension. Hat sanat is an emulation of the levh-i kalem and the levh-i mahfuz. Allah, before He created anything, created a pen: Kalem. Levh-i kalem. And then He created the levh-i mahfusz, a sheet, a sheet of light. And then He said to the levh-i kalem, “write”. And the kalem said, “What should I write?” “Write: Bismillahirrahmanirrahim.” [In the name of God, most Beneficent, most Merciful.] The first thing that was ever written was Bismillahirrahmanirrahim. And every individual stroke or letter took 700 years. And then Bismillahirrahmanirrahim was written out in its completion. And with this levh-i kalem everything was written down: your life, my life, how the earth was formed, the universe. Hat sanat is an emulation of levh-i kalem and levh-i mahfuz. That’s why it’s something spiritual. And to learn this, you have to know the spiritual basis. And to keep decorum. You are writing in the name of Allah. That’s why it’s an important thing. 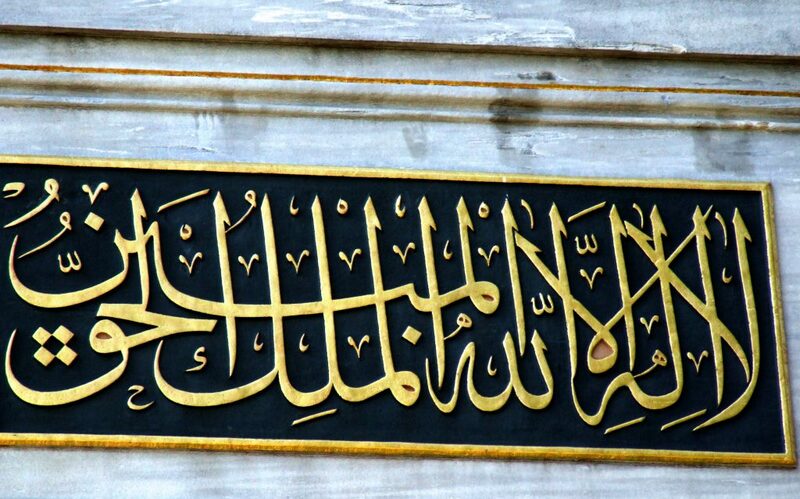 The Turks adopted the Arabic script in the 10th century when they took up Islam. Traditionally, the calligraphy was taught in dergahs — Sufi lodges. Dergahs were places of education, whether in the realm of reading and reciting the Quran or learning the sharia, Islamic laws. In the foreground was Sufism. With time, hat sanat began to be taught in public schools, which in the Ottoman period all had a religious cast. Like in many spheres of Ottoman public life, emphasis was put on beauty. Regardless of what aspect of life the Ottomans applied themselves to, beauty was always attended to; everything had to be aesthetic, including the reading of the Quran and the writing. Later, special hat sanat schools sprang up, but in the beginning when it was mainly focused on in the dergahs, hat sanat couldn’t be learned right off the bat. You had to go to the dergah first to learn proper comportment — adap. Only then could you take up a pen and begin to learn. Traditionally, when a master completed a masterpiece, he gave it to his best student or his children. Thus works of hat sanat were passed down in Turkish families as valuable heirlooms, carefully preserved. In the modern era, as high quality hat sanat pieces began to fetch high prices, the spiritual became less and less important, and these family jewels were sold. In 1928, in the third Grand National Assembly, Atatürk effectively abolished the Arabic script. After secularizing the nation, the script was seen as the last tie with the East and Islam, and it had to go. The simplification of the alphabet had been discussed at intervals during the late Ottoman period, against strong opposition from Islamic authorities. Proponents of reform argued that the Arabic script was ill suited to the nuances of the Turkish language, and hindered literacy. Our rich and harmonious language will now be able to display itself with new Turkish letters. We must free ourselves from these incomprehensible signs that for centuries have held our minds in an iron vise. You must learn the new Turkish letters quickly. Teach them to your compatriots, to women and to men, to porters and boatmen. Regard it as a patriotic and national duty … and when you perform that duty, bear in mind that for a nation to consist of 10 or 20% of literates and 80 or 80% of illiterates is shameful. … We shall repair these errors, and in doing so, I want the participation of all our compatriots. … Our nation will show, with its script and with its mind, that its place is with the civilized world. Turkey was hence transformed into a classroom led by Atatürk, the schoolmaster. Blackboards were put up around Dolmabahçe Palace, and Atatürk became so carried away by his mission that he even composed an “Alphabet March” for the people to sing and so master their letters more quickly. The evening the script reform became law, the alphabet was displayed in colored lights on the main buildings in Ankara. Today, more than 80 years after Atatürk’s reforms, there are 1,000-year-old books no Turk can read, and monuments and grave sites inscribed in beautiful hat sanat that remain inscrutable. Resul Efendi takes issue with the Kemalist position that the Arabic script complicated and stood in the way of literacy. With the Arabic script, for every sound there is a letter. For example, in German “tsch” — you have to use three letters for one sound. Arabic is more precise, and since Arabic was more precise, they took up this script and developed it further for their own Turkish language. They said there were a lot of illiterates there. That’s wrong. 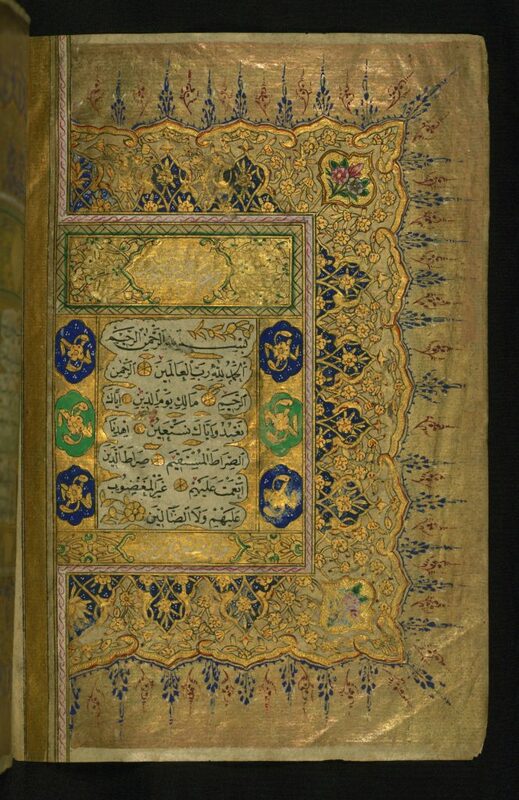 In the Ottoman Empire, everyone could read and write. That included every woman, every girl in every village. Do you know when they became illiterate? After the new script came into effect. Be that as it may, and despite Atatürk’s reforms, hat sanat continued to be practiced in Turkey. Masters continued to tend the tradition, passing it down to apprentices. Some even say a renaissance in hat sanat is occurring in Turkey at the moment, as the second generation of non-Ottomans comes of age. Muhmmed Hanefi Kutluoğlu is a professor of political history of the Middle East at Istanbul University, and also teaches Ottoman Turkish and collects hat sanat. Thirty years ago, Kutluoğlu started collecting Ottoman calligraphy. 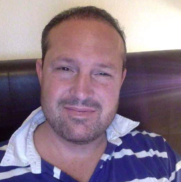 He was in his 20s at the time. Back then, hat sanat had not yet reached the prices fetched by the art form today, which he sees as following the tendency of modern art in terms of prices being asked for. I asked Professor Kutluoğlu how the art world was viewing hat sanat, seeing as hat sanat was following art market trends in terms of prices. “It’s a good point,” Kutluoğlu says. “It is a new process. In every art when you are trying to create something new, or some new processes, there is opposition and supporters. It is something in between, 50-50, let’s say. Today hat sanat is still a struggling art form in Turkey, and some people I spoke to in Istanbul expressed surprise that this antiquated art form still persists in the modern consumer age. At the moment, though, there is a revival of interest in all things Ottoman in Turkey as President Tayyip Erdogan breathes new life into traditions long since passed off for dead. So, who knows, perhaps hat sanat will face a rosier future in Istanbul and in Turkey. 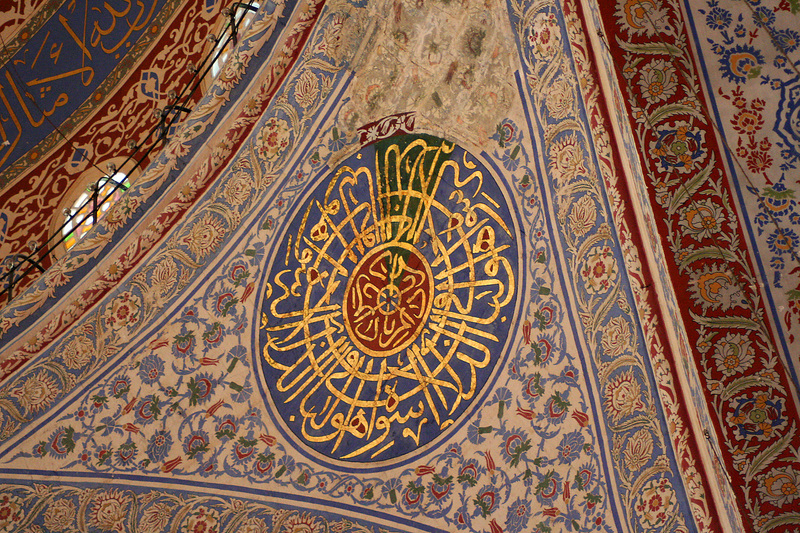 *Image: Calligraphy in the Blue Mosque in Istanbul. Flickr/Vince Millett.